potentially nervous: fats sneaks away hoping no one will notice. bump update in comments. fats sneaks away hoping no one will notice. bump update in comments. hey ya'll!! so please before you going poking, popping lancing around on what you think may be some sort of bump or abscess or pimple or ingrown hair check your bunny's symmetry. i do know to do this, but somehow this one escaped me. it wasn't until i read a comment left by a visitor that i checked again only to find another identical bump on his other cheek....well it probably used to be identical, but now the examined one is a bit swollen after all my 'attention'. i'm really hoping i haven't damaged the functionality for whatever the purpose of this enlarged follice is. if anyone knows what that fucntion may be and how serious the damage would be if it were damaged please please let me know! In all honesty, I'd see a vet before treating my bunny, especially when it comes to doing things that would make either of my fabbits squirm like little tasmanian devils. I think it was sort the whisker holder and has not function, keep it clean if skin is broken and kiss the bunny. Did Fats cause all that destruction? Wow! To Alice : Thanx for telling me about Dana Krempels. 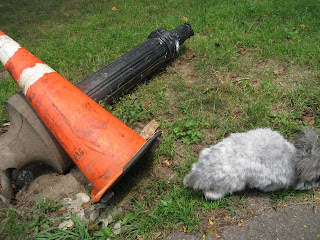 I already wrote to her a few questions regarding Achilles and my other bunnies' problem. Thanx a lot!